Nobody will ever hit sixes like Sir Vivian Richards. Nobody will ever clear the boundary with such relative frequency - or with the same awesome combination of serenity, power, ease and disdain. He turned it into an art form. There were bigger and better sixes, not least in the 1979 World Cup final, but Richards' straight six off David Lawrence captured one of his greatest qualities - the ability to turn bowlers into Sisyphus. Lawrence had one of the more vigorous fast-bowling actions; journalists were contractually obliged to describe him as "bustling". He gave a little piece of his soul to every delivery. All that effort instantly rendered worthless by one effortless swing of the bat. The ball was halfway to Derby before Lawrence had even finished his follow-through. Richards used the six as an expression of undeniable superiority. They were worth a lot more than six runs, because of the impact they had on the bowler. 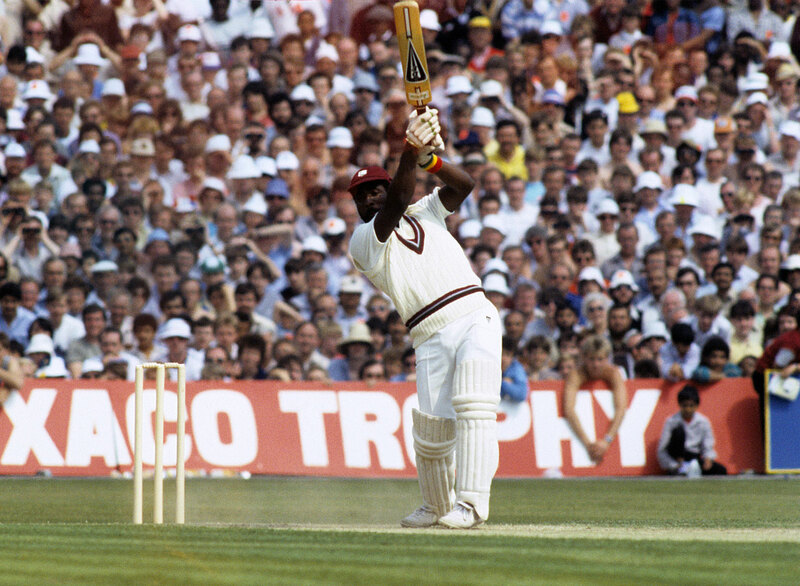 During his legendary unbeaten 189 in an ODI against England, Richards flicked Ian Botham for six. Botham waved his hands around, overwhelmed by futility, and looked this close to shouting "It's not fair." Richards was a fast batsman - not just in the speed he scored and the speed of his hands, but the way he reversed the relationship between quick bowler and batsman, hunter and hunted: mental disintegration achieved without saying a single word. Every kid at school had a grainy VHS to watch on loop when nobody was around. It's just that the less, erm, pubescent were more interested in the joy of six - in my case, highlights of the 1992 World Cup semi-finals, the first cricket I ever recorded for posterity. Two things stayed in the mind. The England fan who went through the entire range of human emotions in a few minutes at the end of the second semi-final - even though a ball wasn't bowled in that time. The other was Moin Khan's audacious six to put Pakistan on the brink of their first World Cup final. Pakistan needed nine from eight balls - pretty tricky back then - when he swiped Chris Harris over long-off for six. It's the kind of shot that lodges itself in the mind's eye, and especially the mind's ear: I can recite Bill Lawry's commentary without thinking. The next ball was pulled for four, and a game that looked set to go to the last ball didn't even go to the last over. The non-striker, Javed Miandad - who knows all about hitting timely sixes - celebrated so joyously that he looked like he was trying to fly. As well as further fuel for a burgeoning love affair with Pakistan, which started when I "watched" a teenage Waqar Younis destroy New Zealand on Teletext, the six was a classic example of one of the most fascinating parts of any major tournament - the exquisitely cruel moment when the hosts, hitherto so innocent and hopeful, have a knife plunged into their heart. One New Zealand fan was so dumbstruck that he didn't move for seconds, as if somebody had paused him, and you can hear the gasps and shrieks as Moin's six goes the distance. Especially when you're watching it for the 400th time. Who needs self-help books when so many of the great Australian sides of the 1990s and 2000s have released autobiographies? I devoured them, even the ones that made War and Peace look like a short story, expecting profound insight into mental strength and personal development from these flinty-eyed Paul McKennas. Turns out they all have the same fragilities as us; they just hide them a lot better. Ian Healy once said that Australia were the masters of bluff. His wonderful book Hands and Heals confirms he was speaking from experience. Healy strutted like a man immune to self-doubt. His six to win the glorious Port Elizabeth Test and give Australia the first of many series victories over post-isolation South Africa is a perfect example of Healy and Australia ignoring pressure. In fact, Australia were having a fraught tour, with the captain Mark Taylor's desperate batting form the most significant of a number of problems. During the run chase, Healy was "very, very nervous", with "legs like jelly" when he came to the wicket. He became distracted by a group of noisy schoolchildren, and started singing Bryan Adams' "Have You Ever Really Loved a Woman?" to clear his mind. With five needed, Australia lost their eighth wicket, and South Africa were one away from Glenn McGrath. Jason Gillespie played out the over and then Healy lofted Hansie Cronje's third ball high over square leg for six. He was only the second Australian, after Alan Turner, to win a Test with a six. It was one of the moments of his career, not least because his missed stumping chance had cost Australia in a similarly epic match in Karachi two and a half years earlier. 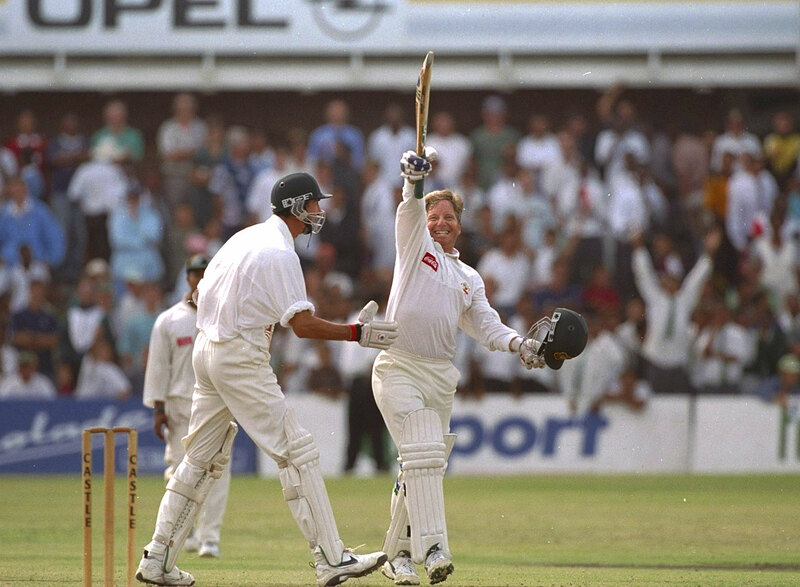 Amid the celebrations, Steve Waugh shouted in his face: "Karachi's gone, mate!" What nobody knew was that it was an accidental knockout punch to win cricket's heavyweight championship. Healy had only been aiming to hit a four, but he went through with the shot and connected so sweetly that it sailed over the rope. For a six to stay in the memory, a batsman doesn't just need to find the sweet spot of the bat - he needs to find your sweet spot too. A six can become yours for all kinds of reasons - from its trajectory, to the batsman, to how much coffee you had that morning. John Davison's barbaric blow against New Zealand at the 2003 World Cup comes into that category. There is so much to love about it. It was the third six in Jacob Oram's over; it made the most beautiful noise off the bat; it was scored by a man who played for Canada, who had already, against West Indies, hammered the World Cup's fastest century; it went so high it probably appeared as a UFO on air traffic control displays. The best thing of all might be the gunslinger's response, a studied walk down the wicket as if to say, "Yeah, no biggie." He was right: it wasn't a biggie. It was monstrous. The size of sixes in the modern game has us reaching for our internal thesaurus, or making up our own words: monstrous, huge, mahoosive, thunderbastard. 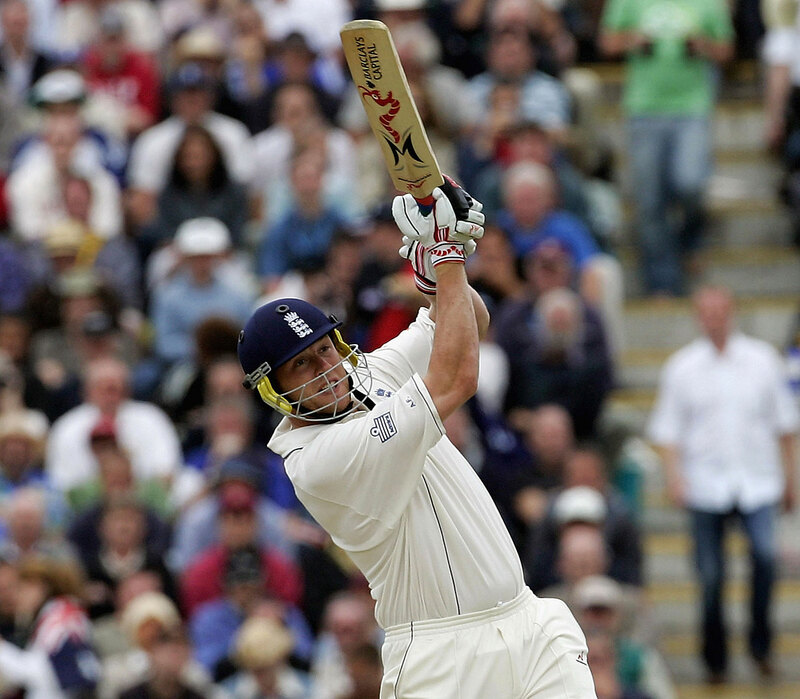 To some, such sixes will always simply be "massive" - the subconscious result of Andrew Flintoff's massive attack on Brett Lee during the 2005 Ashes. It was an extraordinary shot, a bottom-handed bunt back over long-on. But like so many great scenes, what elevates it further is the dialogue: Geoff Boycott's background cackle and particularly Mark Nicholas' infectious commentary: "Oh, helloooooo! Massive! MASSIVE!" It was my generation's confectionery stall. There had already been moments of fantasy and hyper-cricket in the series, but this was off the scale. It wasn't apparent at the time - England were still in danger of going 2-0 down - but this was the moment the 2005 Ashes lost its return ticket to the real world. That Flintoff six is a microcosm of the greatest cricket England fans will ever see and will ever want to see. It is instant serotonin, something that should be bookmarked for a bad day. If I could take a single six with me to the next world, this would be the one. Who has hit the biggest six? And why aren't modern batsmen breaking the records supposedly set ages ago? Can Southee be Test cricket's greatest six-hitter?